Italy - With the latest tragic drownings in the Aegean on Wednesday and Thursday—along with four new deaths reported today off Spain—IOM now estimates that the total number of migrant deaths on Mediterranean sea routes to Europe have surpassed 3,329 in the first ten months of 2015. The sea-borne death toll on the Mediterranean for all of 2014 was 3,279, according to IOM’s Missing Migrants Project. “The tragedy in the Mediterranean has no end,” said IOM Greece’s Kelly Namia, who reported this morning that on Thursday (29/10) night, a wooden boat capsized off the coast between Kalymnos and Kalolimnos. An estimated 14 people lost their lives, while 138 migrants have been rescued. On Friday (30/10) morning, Ms. Namia reported that three more migrants died from a shipwreck off the coast of Rhodes, but at least three more remain missing. Six migrants have been rescued. Deaths off the Greek islands, notably Lesvos and Samos, have surged with the cold weather setting in. IOM estimates 435 men, women and children have died on the Eastern Mediterranean route linking Turkey to Greece since October 6th. October 28th could be described as the deadliest day in these waters this year, with five fatal shipwrecks – two off Lesvos, another two off the coast of Samos, and one off Agathonisi. The worst incident was off the coast of Lesvos, when a wooden boat carrying from 300 – 500 migrants sank. It is unclear exactly how many people were on board. According to the testimonies of those rescued, the boat had two decks and when the upper deck collapsed, the boat immediately sank. The Hellenic Coast Guard and a Norwegian vessel, the Peter Henry Von Koss, rescued 242 people. Seven bodies (four children and three adults) were recovered. There is verified information that another 34 are missing, but the number may be much higher and the Hellenic Coast Guard is continuing search operations. The Peter Henry Von Koss, part of the Frontex-coordinated Operation Poseidon Sea, was the first to arrive at the scene and played an important role in the rescue operation, saving 120 of the 242 rescued migrants from the water. The same day, the Hellenic Coast Guard rescued a boat taking water off the coast of Lesvos’ Mithimna port. Two children – a boy aged 6 and a girl 3 aged 3 – were unconscious and one later died in a hospital on Lesvos. Some 71 people were rescued. The third incident happened off Agathonisi. According to the Hellenic Coast Guard based in Samos, 372 people reached the island after their boat capsized, but another three died and one infant went missing. That fourth victim’s corpse was found Friday morning, IOM’s team in Greece reported. Near Samos, Coast Guard units also rescued 52 people from an incident off the island’s Cape Gatou coast. Authorities say another 3 people – believed to be from Syria and Afghanistan – died, with one infant still missing. Remains of the dead were removed to Leros. In yet another incident reported off Samos’ Agios Konstantinos port, some 47 people were rescued and 2 people remain missing. A 5 year-old Syrian girl later died in a nearby hospital. Because of the bad weather and the rough sea, IOM staffers say that sea searches have become increasingly difficult. Despite the severe and windy weather conditions, daily arrivals in Greece continue at high levels. Some 6,635 migrants crossed into Greece from Turkey on October 28th and 6,637 on October 27th. Meanwhile, 1,042 migrants were rescued at sea in the Channel of Sicily on Wednesday. Rescue operations were carried out by the Italian Coast Guard and Irish, British, German and Slovenian naval vessels. Migrants were rescued from 6 rubber dinghies and from a wooden fishing boat, which was carrying 439 people. The majority of rescued migrants have been transferred on the Norwegian ship Siem Pilot, which is expected to arrive in Reggio Calabria this morning (30/10), with 824 migrants on board. The remaining 218 migrants were brought yesterday to Lampedusa, where IOM staff reported that the main nationalities were Nigerian, Senegalese and Malian. Among the arrivals were several Nigerian women, who may be victims of human trafficking. “Sea conditions are deteriorating this time of year and the risk of shipwrecks is very high in the Channel of Sicily, where so far this year, 2,860 migrants have lost their lives. The work carried out by the ships patrolling the area is extremely efficient, as rescuing over 1,000 people at sea in just 24 hours is a very difficult and dangerous task,” said Federico Soda, Director of the IOM Coordination Office for the Mediterranean in Rome. Data on deaths of migrants compiled by IOM. All numbers are minimum estimates. Arrivals estimates based on data from respective governments and IOM field offices. 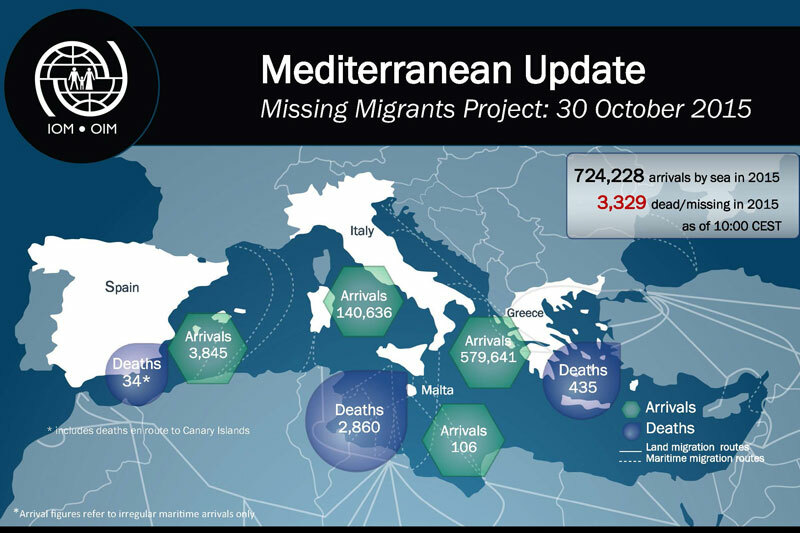 *Data on deaths in the Eastern Med route are estimates based on confirmed number of victims of Wednesday’s shipwrecks. * Unofficial data regarding exclusively the so-called “blue” borders, as derived by the data collected by IOM staff in Greece and the Greek authorities (1/1/2015-28/10/2015). 2014 Totals: 34,442 arrived by sea to Greece between 1 January and 31 December 2014.